There is often pressure upon patients with rheumatological diseases to not use current disease treatments. This type of pressure is less common for patients with other serious diseases such as diabetes or cancer. We all try to laugh about our sister-in-law who insists we’d be better off with cherry juice than a disease modifying drug. But it can get more significant than that. An RA patient recently said her dentist told her to try a more natural treatment for RA. When my MD was out of town, his fill-in tried to convince me to quit trying different biologics and take an anti-depressant instead. Then there is the article by Dr. Lee on Juvenile Arthritis in the Santa Ynez Valley News which was passed around last week via Facebook and Twitter. Dr. Lee has several interesting theories about the causes and treatments of Juvenile Arthritis. Stress, anger, medications, emotional problems, drinking, or drugs during conception or gestation. Radiation from electricity, poor nutrition, or pollution in the household. Joint exercises and heating the affected areas. JRA disappears due to the strengthening of the child’s immune system. 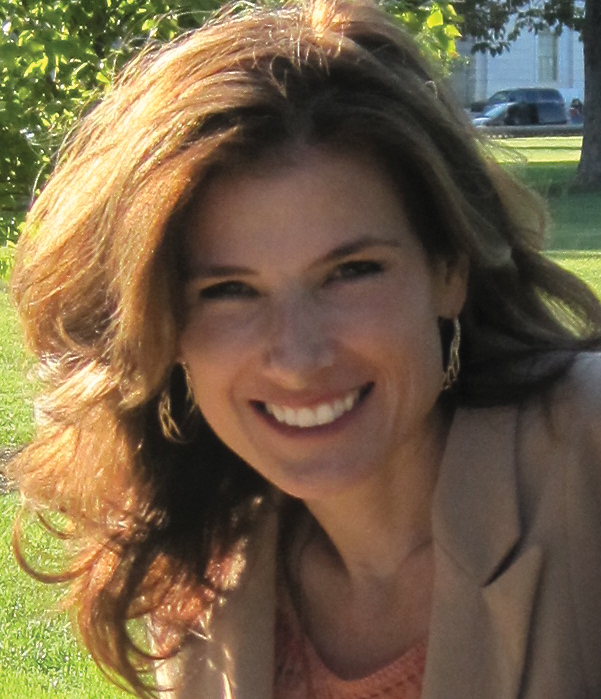 As a mom of a JRA patient (with several complex diagnoses), Danielle wrote a good rebuttal, Addressing the Inaccuracies. However, since this article by Dr. Lee is only one example, I think this problem goes farther than Juvenile Arthritis. I believe that more progress will be made in treating these rheum diseases when there is greater understanding about what they really are. None of these diagnoses are the patients’ or the parents’ fault. None of them are preventable, curable, or are easily treated. Not only as a response to the statements of Dr. Lee, but also as a general statement about the need for acceptance and availability of current and even new medical treatments for rheumatological conditions, this will be the topic of the next blog carnival to be posted February 25, 2011. NOTE: Carnival date moved to Monday Feb. 28th. Are rheum patients pressured not to take medical treatment? Have you ever read an article that sounds like it discourages medical treatment for rheumatologic conditions? Whether the alternative offered is Eastern medicine, non-prescription medicines, or dietary changes, or spiritual advice, what would you like to say to anyone who would tell patients to forgo medical treatment? Note: The Rheum Blog Carnival on rheumatology topics is open to patients, doctors, caregivers, and organizations. We welcome the input of various opinions and viewpoints concerning different autoimmune arthritis diseases. If you’d like to have a post included in the carnival, please email the link to your post to me Kelly @ rawarrior.com. Edit: Blog Carnival 3 is up – here’s the link to come read all the great posts. When people tell me crazy things like to try acupuncture and massage in lieu of DMARDs, I explain that RA is very similar to Lupus, and that usually shuts them up. 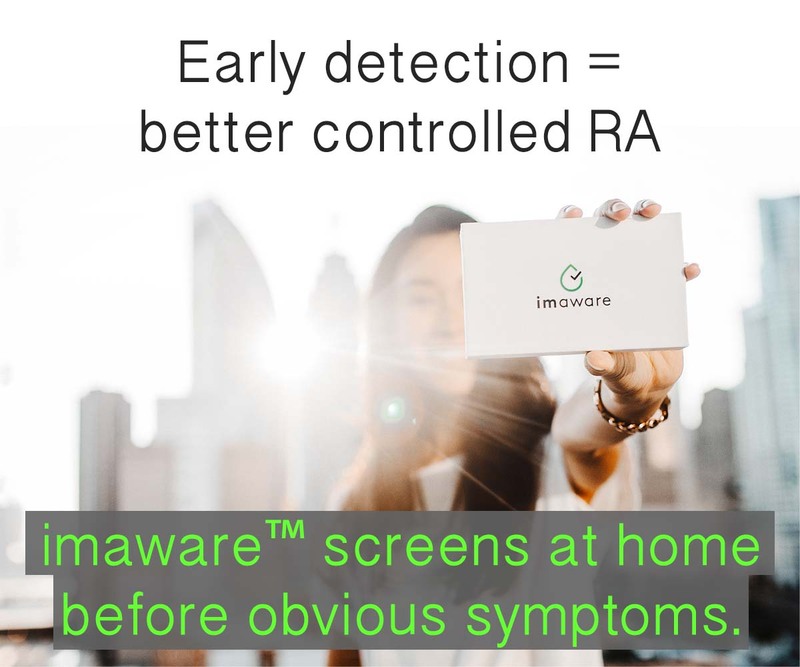 Sad though that there is not enough knowledge about RA out there that it takes comparison to a well-known, more highly-publicized disease to garner even an inkling of understanding. Really, “The proper weather on the day of conception plays a part.” What the heck is up with this guy? My massage therapist often says to stop the mtx and go the natural route. I don’t generally respond or change the subject. Do people really think we would take these dangerous drugs if we didn’t have to? This topic is interesting to me as I had a rhemutologist tell me that RA is caused by artifical sweetner. He has his patients go off any treatments and limit any artifical sweetner. I work with one of his patients and she is getting worse everyday. She can’t understand why I stay the same taking the biologics. Someday we will look back and laugh at some of the treatments used today. What would he say to someone who never uses artificial sweetener or products containing it?! This has not been my experience. In fact, it is quite the opposite. People are always pushing me to take more drugs. When I was first diagnosed I thought it was too premature to start DMARDS. My family and doctors were insisting and preaching that I should use the medication. Two months later I started with MTX. At the first follow-up visit my rheumatologist started preaching Biologics. I did not want to get into Biologics right away. I wanted to give more time to MTX to see if I would get results. Every follow up visit with my rheumatologist was a lot of stress. He would hit hard on me trying to convince me to go to Biologics right away. Saying that my hand would be all deformed and useless in one year if I did not. This Dr. Lee seems crazy. I have a hard time accepting most of his comments as it relates to true JRA patients. However, there are as many patients mis-diagnosed with JRA as there are patients un-diagnosed. JRA is becoming a common medical term and many doctors who cannot find the real problem are labeling kids with JRA. For someone mis-diagnosed with JRA some of Dr Lee’s comment may make sense. I’m with you Alberto, I was pushed straight into all sorts of medication as soon as I was diagnosed, actually before I was diagnosed I was already on NSAIDs for swollen knees! (that was a good look!) Anyway, it was my dad’s chiropractor (who was dying of pancreatic cancer at the time) who told me to take care with ‘these drugs’ – cos ‘they’ll kill you!’. Twelve months later he was dead and it certainly had an impact of me. My Rheumy has been trying to get me onto mtx and biologics for years but I’ve held back. Mainly because I can. (I did give it a try – unsuccessfully). I’m may be in pain but it’s not unmanageable or unbearable. I knew that my hands were going to become deformed, but I chose that because the stronger drugs made me feel so sick I wasn’t coping at all. Having read how painful RA can be for others (not being able to get dressed etc), I realise that I’m fortunate enough to have ‘manageable pain’. Maybe that’s my pain tolerance or just the level of pain I have who knows – it so hard to quantify pain. I definitely have RA, and it’s in every joint that moves, head to lumpy old toes. I certainly have the deformities and swelling and pain to prove it, even though the blood tests are negative. What I have found, with my many years of experience trying every alternative under the sun, (acupuncture, chinese herbalist, chiropractor, podiatrist, vitamins, minerals and dietary supplements, as well as a range of GP’s and two of the most highly regarded Rheumatologists in Melbourne, who could not agree on the diagnosis until it became obvious that it was RA and not anckylosing spondylitis!) is that everyone thinks they have heard of a magic potion for arthritis and RA is different for everybody who is unfortunate enough to experience it. I did not know about a lot of “misdiagnosing” or “over-diagnosing” of JRA – I’ll keep an eye out. For some reason, what I usually see is that docs are extremely hesitant to diagnose RA generally and prefer to diagnose “Lupus” more often – THAT seems odd to me since lupus is so much more rare and therefore less likely. Thanks for the laugh. Sometimes laughter is the best medicine. Hahaha. I would rather not know. Dr. Lee certainly has some very strange ideas! I have been on mtx, prednisolone, plaquenil and arava and got seriously ill on these drugs. My rheumy took me off them and even though planned to go onto enbrel he no longer will look at that treatment or any other biological. So I am trying to live with r.a using painkillers, probiotics, raw food diet, no dairy and have just started taking antibiotics M,W,F. It is worth a try but if it doesn’t work what will I do then? Wow! So he will just NOT help you. That does not sound like a good rheumy. Since you mentioned probiotics have you checked VSL#3? Of course this is not a cure. But worked best for me. Since you mentioned raw food diet, have you checked http://www.drfuhrman.com? Thanks for those suggestions – have just ordered one of dr. fuhrman’s books – the more info the better. My rheumy is good – the best I’ve been to – just not prepared to try biologics because of my serious reactions to the drugs he has already tried me on. Val, it’s sad to hear about your situation with nothing helping. 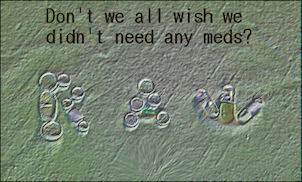 Without my meds, I know I would not be able to work. What kind of side effects did you experience from the meds? I’d love to know what kind of probiotics and antibiotics you are on, as I’ve thought about adding these to my current regimine to see if they might have any added benefit. The probiotic I use is Inner Health Plus – Dairy Free (Australia). The antibiotic is minomycin which I take M W F. I took large doses of prednisolone for 12 months after getting “walking pneumonia” in Eastern Europe. I was seriously ill. From then the r.a. was out of control. I have a VERY GOOD rheumy and have complete confidence in him. I tried methatraxate, plaquenil, arava, prednisolone -had rash all over body, chronic itching like ants under skin, nauseau, vomiting, serious lung problems (used to power walk 5 kms a day – couldn’t even walk to the front gate without puffing and gasping for breath), headaches, liver enzymes sky high, gastritis, chronic fatigue, fainting, permanent eye damage, etc. Rheumy was going to try Enbrel but I have had several nasty episodes with cancer and rheumy not prepared to give me a biologic. So with the support of my rheumy and doc have started antibiotics. Have been on them for 3 months – had around six weeks where I was was pain free and almost normal again. Have got a fair bit of pain back but not as bad as when I was on the other meds. I DO NOT believe in a lot of the “natural” cures that are out there but do believe a healthy lifestyle, no junkfood etc. can help. The antibiotic treatment may be the wrong decision – time will tell – but I have no other options and I feel reasonably confident with the backing of my rheumy and doc. Interesting. I have read many case studies about JRA being treated in China with herbs and acupuncture successfully and they seem consistent with what Dr. Lee said. It seems crazy to a western mind I am sure. Of course, I have treated my RA with herbs, acupuncture, diet and several other techniques and I am about 95% better, so I have to say it works. I don’t think most people are very open to it though. Too bad really because all alternative medicine is not the same. Simple thoughts for simple minds I guess. Joe- I believe that there has to be a reason that Oriental medicine has been around for many years longer than Western meds. The thing is, not every medicine or type of treatment will work for everyone. The bigger picture with this story however isn’t about the treatment- it’s about the way that this doctor chose to write this story. He cited many incorrect facts, and in general made it seem like JA is no big deal; it’s all the parent’s fault anyway, isn’t it? These are misconceptions that the families of JA kids everywhere are trying to clear. I don’t want my child being told that she’s faking it, or she can’t be sick because she doesn’t look it! The man could have written this so much better. Thank you for your thoughtful response. I have to say though that I don’t think his assessment is incorrect. Traditional Chinese Medicine (TCM) doctors have their own criteria for diagnosis that doesn’t necessarily translate to the Western one. There is a lot of mis-understanding because of this. For instance, when he says the child’s immune system is weak, he means it is not regulating properly. Western medicine does not have the idea of “regulating,” we have immune suppressed or an overactive immune system; there is no in-between. Much of the confusion also resides in the issue of blame. No one is blaming anyone; they are simply stating the causative factors that contributed to the disease and what can be done to fix them. As far as diet and such, it’s only part of the picture. Many people have glossed over the acupuncture, herbs and tui-na (Chinese Massage.) They are very powerful tools that affect the body more than most people know. No one is diminishing the suffering of JRA or RA. I will say TCM has to be used more intensely than it is usually administered in the US to be effective. I have experienced my own healing and have seen and talked to others who have as well, including JRA. From his perspective, because he has treated JRA successfully and seen how it can be healed, he talks about it the way he does. He is not being cavalier or insensitive. It’s a shame really, because although no medicine is perfect, TCM is a legitimate form of treatment and can work in many, many cases when administered properly and early enough (and even later.) Unfortunately, many people dismiss it out of hand without truly grasping what they are dismissing. It is rather hurtful and disrespectful when people dismiss it as “quackery” or kookiness, but as a profession we are used to it in the US. Thanks for taking the time to respond. I take it you are one who thought TCM was a bad deal, so got offended with the simple minds comment. Funny you mention mugwort, that is actually the herb used in Moxibustion, another successful treatment method used in RA and other diseases. As far as having a choice in America, we really don’t. Insurance doesn’t cover acupuncture visits typically, or at least not enough to be effective. As far as the rest of your response, acupuncture and herbs have been found to be largely successful with regards to stroke and helping stroke recovery. There are already thousands of studies done showing the effectiveness, but most are in Chinese. As far as Dr. Lee not being an MD, in California licensed acupuncturists are considered Primary Care Physicians and don’t need to be MD’s to practice. I have to ask though, have you actually researched TCM beyond what you read in a blog somewhere? I have to laugh whenever someone says they are glad I am healed, cured etc.. because they always say it through clenched teeth. It’s interesting, I never said TCM was a cure-all or worked for everyone, yet you responded that way. I would imagine you were kind of upset and didn’t fully read my post. As far as Dr. Lee, he and thousands of other doctors have treated patients using the same theories and modalities for a long time, with great success, so not sure what to say to your critique of him. I just wanted to put the alternative out there, with a little less ad-hominem attack. Also, I don’t think Dr. Lee smokes crack; but I would imagine he probably meditates quite a bit. Most of the doctors I was instructed by do. Interesting no one thought that was at all disrespectful, but since most of us Americans are bigoted about race and knowledge, it doesn’t surprise me. Nothin’ left to say, but good luck. I think your statement “simple thoughts for simple minds” was cruel and unnecessary. I lack the tact and kindness that Danielle has, so often with comments like these I don’t respond; however I feel I must respond to this. How wonderful for you that your RA has improved 95% with alternative medicine, although as Danielle kindly stated “not every medicine or type of treatment will work for everyone”. You responded in part by saying “for instance, when he (Lee) says the child’s immune system is weak, he means it is not regulating properly”……if that’s the case, Joe, then why didn’t he just say that? If this is an East West translation thing I would think that a ‘doctor’ living and practicing in southern California would have the capability to get a globe, figure out his location, and write his article with out requiring translation from you. TCM for some people can be really good stuff, and biological dmards for some people can be really good stuff. Are you picking up what I’m slappin’ down here Joe?? People differ greatly, disease severity and response differs greatly, and treatments for these diseases differ greatly. Now as far as Lee goes, I don’t think he helps the promotion of TCM very much which is a shame as some of these therapies are being tested in trials and let’s face it, those of us with autoimmune disease need all the help we can get. But again, we are all different and respond in different ways and we don’t need guys like Lee assuming that everyone out there should be following his protocol when he writes “The best treatment for these children is daily massage of the affected areas, better nutrition, reduced stress, light acupuncture and moxibustion treatments, herbs, and added love and affection.” nor do we need you making snide comments about simple minds. We believe in the choice to follow what we think is best. We actually get to have a choice here in the west, Joe. Maybe if we didn’t we’d all have a stash of mugwort in the cabinet too? I just can’t be nice and tactful…….oops. I found an article Lee wrote about stroke; although he has the occasional sentence that comes over as sound medical advice his theme is pretty scary. I think his ideas on what to do when one has signs of stroke are truly amazing. Hold that ambulance! Nope, I’m going down to the corner store for some herbs. One last thing that I found interesting about Lee, the California Medical Board has no record of him. After doing an online search I called them. It seems he is not even an MD. Now what was that about simple minds? Lately I can really relate my experiences to your articles. I am often quiet about my condition due in part to the way some people assume that I am doing something improper to have this disease. After years of accupuncture, massage therapy, TaiChi, Chigung, and any alternative medicine I could get my hands on, I do not want to get into any arguments about R A. Misconceptions about JRA and RA abound. I have a caring rheumey who explains the pros and cons of my treatments and so far I understand the modern aggressive approach of early treatment to avoid joint damage that was never managed so well in the past. My family has a long history of R.A., is that because we we were all concieved on cloudy days? I would tell them it’s easy to offer advice, when you don’t have to live with the consequences. I was in my 20s when I tested positive for rheumatoid factor 34 yrs ago – I road a bike to work and ate healthily – I didn’t take any meds, not even aspirin, so it was quite a shock to suddenly be told I had to take a bunch of aspirin – daily – and naprosyn. But I needed to be able to work, to not only support myself, but to have health insurance. Each drug I went on – gold shots, plaquenil, methotrexate – enabled me to keep working and keep health insurance – I didn’t have the luxury to experiment with alternative treatments and risk permanent joint or systemic damage. That’s not to say I relied solely on meds — I took warm pool classes, practice stress management, take omega 3’s and try to eat a healthy diet. I may take RA meds, but unlike many Americans I don’t take meds for high blood pressure, high cholesterol, diabetes or for depression. When people go off all their meds, then maybe I’ll listen to them. At least for me, my decisions about RA meds, affect only me. My heart goes out to parents of children with autoimmune disease, who have the responsibility to make difficult decisions about what drug treatments are best for their kids — articles like Dr. Lee’s don’t help. And just who in the heck is Dr. Hyun K. Lee – what kind of doctor is he? A pediatric rheumatologist? An internist or GP? He has a practice in Solvang, Redondo Beach AND Beverly Hills — what’s up with that? What? Who the hell is this Dr. Lee? I can’t believe there are still so many nutty quackjob explanations and “cures” for arthritis. Reading this kind of pisses me off. My personal and always-evolving opinion is that the WHOLE person needs to be treated – physically, emotionally, spiritually, nutritionally, etc. I think trusting good, intelligent doctors as well as doing your own research about other things that can very well play into arthritis (such as nutrition and food allergies, exercise, stress, mental health) is crucial to treating the whole person and not only relying on drugs (or totally avoiding drugs). What utter CRAP!!! Matthew has eaten a balanced and home made diet since weaning. I breast fed him from birth and have given him my heart and sole from the moment he was conceived. If we as parents could suffer the pain for our children we would. We hate forcing drugs into our children but don’t you think we’ve already been down the alternative road!!! I’d rather a well child that can run and play with friends than one where pain and growth deformity is there every waking feeling! Many patients and parents of patients have said the same thing. And I believe it because I lived it: eating healthy and exercising, having a great positive attitude and living one’s life in charity DOES NOT PREVENT THIS DISEASE FROM TAKING HOLD. I am glad that there are medicines that can be offered to children which studies say may be reducing the surgeries and deformities for many of them. God bless you & help you both. Even now, some three weeks after first reading that article, I’m still angered by it!!! I admit, however that I have to laugh at how completely ridiculous his theories sound. (I can laugh now, but it took me the whole three weeks to get to this point!) I think that this will be an excellent blog subject; something that will get people fired up! My hope is that once IAMM gets a little bigger, as they are able to reach more people, maybe awareness will grow more. We’ll always have to fight, but maybe just a little bit less. Hey Kelly, Happy Birthday. Well, this topic is righth up my alley…while I applaud those who have had success with nutritional and alternative approaches, I can say that my raw food, dairy-free, gluten-free, cruciferous vegetable-free,etc, etc, diet did absolutely NOTHING to halt or slow this disease. Within 6 months of diagnosis, I was in a wheelchair and in such intolerable pain that I DID NOT EVEN CARE that I could no longer walk anymore or use my arms or hands. This was due to loved ones who insisted that RA could be “cured” naturally, and I should avoid those toxic medications. 72 hours after a REAL doctor put me on Prednisone, I took my first steps and was able to move my arms and hold a toothbrush again. I am still on the nutritional protocol, but it is “also ran” with the real heavy lifting being done via traditional medicine. If you NOT an RA patient, PLEASE, PLEASE do not pressure people to avoid medications for the disease — not only are you possibly sentencing that person to severe disability and pain, you are also implying that their lack of ability to stick with a strict diet is causing the disease – an added STRESSOR (which IS a causative factor in flare-ups!). Thanks Kelly, keep up the good fight. Thank you Judy. Thanks for sharing. Very well stated. Pingback: Hurty Gertie» Blog Archive » Whoa! I think Dr. Lee needs to put his crack pipe away!! hahaha. Thanks for the laugh, Janice. I have a friend who thinks doctors are malevolent and want us to be sick so they can make more money. I listen in awe especially because my own husband is a physician. Like he has nothing better to do than to find ways to screw people over. So yeah, she pretty much thinks Western medicine is a vast conspiracy and I’d be much better off with the right healing energy and all the rest. Now, how the pharmaceutical companies get in bed with the government and keep prices high by forcing out competitors and distorting the market — THAT’S an actual conspiracy. My daughter has a nurse client who beat it into her that all I needed was cherry juice. My daughter is pretty young and didn’t know any better. I’m not opposed to any of that alternative stuff as adjuncts — and I understand trying absolutely anything IF the meds aren’t working. Heck I would too! I’ve had RA for 13 years and have just now come off methotrexate and started Enbrel because I’m trying to get pregnant. I am not happy about starting the new drug, but I was off methotrexate for 7 months and was so miserable I could hardly function (let alone make a baby!). I eat healthy foods and practice yoga and meditation, but that has little effect on my disease status. I have a friend in my meditation class who is convinced that her RA was caused by a poor relationship and job stress. She truly believes that her superhuman efforts to reform her psychological state will somehow reform her physical health. Each time I see her, she is in more pain, has more deformity, and is unhappy. That just convinces her that she’s not working hard enough to be “happy.” It just breaks my heart. I am fortunate that both methotrexate and Enbrel work well for me, and I am grateful to the researchers and doctors who have worked so hard to help me and others like me. Nearly every time I tell someone I have RA, they launch into suggestions for a special tea or herb that will magically cure me. No, thanks. How can I live in the 21st century, with so many options for treating my RA, and refuse to take advantage of them? If I lived in the little house on the prairie 100+ years ago, I would be in a wheelchair, unable to work, and probably unable to have a husband or family. I am truly blessed. Thanks for shedding light on this issue. Hi Shelley – thanks for sharing. We are in a similar place. I was on mtx for a while, too, and decided to switch to Enbrel prior to having kids. We’re not trying yet, but I think the plan will be to stay on Enbrel until conception, then try going off of it (see if pregnancy helps my RA!). Can I ask what your doctors have recommended doing during/after pregnancy? This is a major concern of mine – obviously we’d both rather not take anything while pregnant. I know my doc has had at least one patient remain on Enbrel the entire time w/o issue. My rheumy would prefer to have me on a low dose of prednisone during pregnancy if I need something, though (more research showing its safety). Then he said he’d put me back on Enbrel immediately after delivery, and that breast feeding is fine on Enbrel because the molecules are too large to get into the breast milk. Just wondering what other docs are recommending! Please help me. Today I saw my Rheumy.I’ve been diagnosed with RA for about 5 yrs and have tried several meds including mtx, pred.,etc. currently I am on Imuran 100 mgs. for the last 3 months. Pain in shoulders, fingers, elbows have increased also swelling in my knees. He said it would be by decision if I wanted to go on Remicade, or Embrel. What should I do? Please let me know how you have responded to these drugs and what side effects you have had. I am 66 yrs old and lately my energy level has really declined. your help. I finally started to get some relief after taking methotrexate with enbrel and plaquenel. My rheumy says the combination of the biologic and methotrexate is the best. I agree with Rhonda that is the ideal for aggressive treatment if that’s what needed. Usually safest & most effective that way from what we know so far. I have been on Enbrel for at least 2-3 years. I have had no problems. The only thing I HATE is when you do inject yourself I hate the burning feeling it gives and couple of times I have had VERY LARGE BRUISES. When I do inject myself it’s all ways in the top of my leg. And I also use what is called SURE CLICK type of ENBREL. But other then that it has WORKED WONDERS FOR ME!!! Tracy, maybe you could try the side of your leg since the nurses told me it needs to go where you can “pinch an inch” of fat – some people tell me it doesn’t hurt as much in the tummy either. I think you might be getting bruises from hitting more tender muscle tissue. I’ve had RA for 2 years. Im currently on MTX and enbrel(sure click). I’m 27. The Enbrel is working well for me. I take the shot in my belly, its less painful because there is more fat. I tried my thighs but I got large itchy bumps from the shot. I aslo take Folic acid. I’m not 100% but I can live a normal life….for the most part. I’ve been on almost all the Meds mentioned here. Trying to find the right combination can be time consuming and frustrating, but your Rheumy has me concerned. It’s up to you about biologics? This Dr spent 12 years in school so he/she could advise Pts to flip a coin? That would be a red flag for me to find a new Rheumy. I think it’s common when first considering a biologic, for RA docs to suggest either enbrel or remicade. FDA approved in the late 1990s, they are among the first biologics to treat RA. Whether you choose enbrel or remicade, may depend on whether you prefer an injectible drug (enbrel) or an infusion drug (remicade). Another consideration is your health insurance drug coverage. I assume since you are 66 yrs old, you are on Medicare. Enbrel and remicade are covered differently under Medicare. Remicade is considered a “treatment” so is covered under Part B, which pays 80% of the cost. If you have a supplement to Medicare, then that may pick up the remaining 20%. Enbrel is considered a prescription drug and would be covered under Medicare Part D. It could be expensive because there’s the gap in coverage called the doughnut hole, where you would have to pay half the cost of enbrel while in the doughnut hole. This could be several hundred dollars a month while in the gap. If you have a Medicare Advantage Plan, you’d have to check about how it would cover remicade or enbrel, I’m not familiar with those types of plans — there are several different ones with different drug formularies. Enbrel and remicade are expensive drugs, and coverage can seem complicated if on Medicare. For help with insurance questions you could contact the enbrel and remicade drug companies (they have websites). Good luck with which ever drug you choose, I hope it will help better manage the RA. I hope that you are able to find a treatment that works for you. I have not tried Remicade, but I have been on Enbrel for 3 1/2 years without any problems. Ask lots of questions and go with what you feel most comfortable with. As others have said, Enbrel does have the convenience of being able to self-administer at home, which is one of the reasons I like it. I was on methotrexate previously, and while that helped, too, I think Enbrel has helped me even more. Though I’m not 100%, I can function normally with little to no pain on most days. I’ve never had REmicade so can’t vouch for that but was offered it a couple years ago – I could go on Enbrel or Remicade. The reason I chose Enbrel is that I could give it to myself. I didn’t want to have to take a day out of work, or time off for infusions…That was my only reason!!! After that failed I went to Humira (again offered Humira or Remicade). Again – control!! HAHA!! That’s just me!!!! It was more convenient for me, that’s strictly the only reason why I went with Humira. Now that that one failed, I have no options except for infusions! Oh well, now it’s Orencia for me!! It’s a touch decision. Go to the drug sites – google Enbrel and Remicade…READ everything you can….Good luck!!! Dearest Arlene, so sorry you are having problems with meds. I have taken the MTX, Arava, Folic Acid for my RA and then prednisone for vasculitis, and then Enbrel and Arava for RA, the Enbrel worked for me within two months but only lasted for about 8 months all total, just simply stopped working, Then I went on Humira and have been on that for almost five years but feel it is struggling to keep up, having way too many flares the past 6 months. I know the meds sound scary but without them, I can not get out of bed or take care of even my own basic needs, so I try what is recommended by my RA Doc and go with what helps keep me moving. I heard too many neg. things about remicade and did not want to take it but also my doctors have never recommended it either. This of course is just my opinion but I think I would go with the Enbrel, I didn’t have any side effects for the eight months I was on it, and it helped fairly quick so….hope you can get the help you need. psoractic arthritis). Not only have I been on Remicade for about 6 years- my dosage is quite high. I have 6 vials every 5 weeks instead of the standard 2- 3 vials every 8 weeks. It has been the best thing to happen to me! I can now move, open doors and it keeps the pain and fatigue down to minimum. My “rheumy” is excellent and keeps up with all the blood work and is very diligent about watching my numbers and test results. She advised me the first time I saw her, that if I listened to her and not get scared, that she could get my RA and PsA under control. I can truthfully say it was the best advise I could have gotten. So, I was on both methotrexate and Remicade for the first 2 yrs & went into a sort of “remission”. For 4 yrs now, I have gone like clock work for my infusion and life has been sooooo much easier. I have not had any side effects- just relief! I have been taking Humira for 5 years now and I have been doing well with it. I have took Methotrexate & folic acid but it caused high liver counts so they took me off it totally. The only time I really hurt bad is when its supposed to Rain the it seems that nothing is helping until the rain actually starts. First off the Imuran is obviously not working and you have a definite need to switch medications. Pred is not a long term drug. Bursts or tapers of pred during a flare are okay. Otherwise you end up with loss of bone density and your adrenal glands shutting down. Remicade or Enbrel, eh? There are some considerations with both. Remicade is an every 4-8 week IV infusion given in your doctor’s office or an infusion center. Enbrel is a bi-monthly injection you do at home. You are taught in the doctors office how to inject yourself. It’s actually pretty easy. With the advent of auto injector’s giving ourselves these injections is a matter of put the needle end against your skin and give a gentle squeeze to the auto injector. It is also over pretty quickly as well. Takes about 5 seconds for my Simponi to inject. As with any biologic it is a good idea to have a DMARD to take as well. Usually MTX is the DMARD of choice for most rhuemuy’s. I also would inject mtx. Virtually no stomach upset like you get from the pills. You also absorb more of the medication faster into your body. I had a bad toxic reaction to mtx a few years ago but have gone back on it so my biologic works better. Please keep in mind that any biologic you may try needs to be given 3-6 months for it to work. There are cases where it does work immediately the FIRST time but that is rare. You have to have a lot of patience to have RA. I have had RA for going on 18 years now and the advances in medications have been tremendous and they keep on coming. Some meds attack and either kill or suppress B cells. Some meds attack and either kill or suppress T cells. Both are responsible for inflammation. Remember that any biologic will suppress your immune system as well. It’s bad enough we already have an immune system busy doing the wrong thing we have to go and suppress it as well. Lots of hand washing and hand sanitizer. My preference for biologics has always been inject at home. Not only do I have cruddy veins from IV’s all the time and it takes 3 or 4 sticks to get an IV in me, but who wants to go out when they are flaring? Thanks but I think I will stay home and inject myself. Cost is also a factor. If you are 66 you should have a Medicare supplemental policy. I have one but that is because I am disability. I get Medicare at 42 because of that. Keeps us posted on what you decide! I have been taking the Sure Click Enbrel for years with methotrexate. I only take Celebrex when it hurts bad enough for me to recognize that I have other medicine to take. My Navy doc switched me to Humira for a deployment overseas because it was cheaper and easier for me to take while away…once every 2 weeks vice once a week, (less medicine to store on a small ship…) but I felt better while on Enbrel and asked him to switch me back which he did. No problems now. I dig it…can hold the push up position for more than 60 seconds at a time during PT and drop to my elbows for another minute leading into planks and other plyometric exercises for an hour straight! Love it! I got good relief with Enbrel most of the time for 8 years, along with prednisone, mtx, plaquenil, etc. Always numbed my injection site with an ice bag first, and made sure the alcohol wipe was dry before the poke. Also alternated each injection site from right to left thigh, then fleshy stomach area to give skin a chance to refresh and avoid itchiness. Enbrel was a blessing giving me normalcy from age 55-63. Then my kidneys failed, and I have been on chemo drugs Cytoxin and Immuran, and off Enbrel for 2 years. My RA is still manageable. My Rheumy said he could keep my pain low, but the rest of my life would be keeping me alive from side effects of a very compromised immune system. Now I understand the big picture, and am grateful every day for Life. Thanks all for sharing on RA site. Interesting comments, quite a range of different treatments, drug chemistry suggesting different immune disorders. I am still leaning towards complex sensitization. My own case, appear to have become, developed, a problem towards some yeasts and perhaps preservatives, enhancers (MSG) that maybe one source of a “flare up” or spark a cumulation of effects. Appearing to eat healthy may not be that good for everyone! I’ve never known to be “allergic” to anything but that appears to have changed since about 2005, I’m continuing with MTX & Cortisol. McDonalds, potato chips, bread, beer, yeast extract are off the menu again. 4yrs ago I was crawling on my hands and knees to get around,was taken into hospital and given enbrel at seven in the evening,next morning to my amazement I could get out of bed and went and met my husband at the door of the hosp.I took it for 2yrs then it gstpped working,Im now on humira,metatextrate and folic acid,no side effects. Hopefully it will work for you. I took Remicaid for several months 5 yrs ago and it was awesome! The infusions are a pain and the one downside was it wiped my immune system completely. But honestly after having RA for 20 yrs I am sick and tired of my immune system anyway. 😀 I stopped taking it because I lost insurance. I am looking to go back on it again because the cimzia that is my newest drug is not working, and has caused me to break out in rashes. Embrel seemed to be a bit gentler but it stopped working for me within the first year. I did like the ability to inject at home but I have trouble doing it myself. I jump for some reason, but if the Hubby does iyt I don’t, go figure. I feel for you. I am trying to make the same decision. I am currently taking Methotrexate and my liver is producing enzymes. Down to 4 a week along with folic acid. I am really scared to take any of the biologics. I have pain and stiffness everyday. The side effects really scare me. I feel if I can function I should hold off until I can’t and then take them.The lymphoma risk really scares me my Mom has it and my concern is I am already predisposed. It’s a hard decision. Good luck. I had this chat with Kelly a few months ago as I was also afraid of anti-TNFa therapy because of lymphomas in my family as well. I also talked with my rheumy about this. From everything I’ve read and heard, the rates of cancer are low in general. My doc said the bigger risk is an infection and what RA does to the body if left unchecked. I think it is always better to halt progression of this disease as much as possible. Once a joint is damaged it doesn’t repair itself and you lose function permanently or face joint replacement. Talk to your doc about your concerns and what to do. My doc talked me off the ledge. It was a really hard decision for me to make about treatment for r.a. I felt fine with no symptoms at all which made the decision so difficult. Firstly I said no to methatraxate etc. but in the end decided to give them a go. My rheumy eventually made the decision to take me off all the drugs because of serious side effects and other health problems I have. I am one of the lucky ones who got r.a. when my hair was going grey and getting an ever increasing number of wrinkles. It WILL NOT stop me from living my life to the max (will be just a little slower), cuddling my grandson(such good therapy), travelling overseas (only two years ago I was backpacking through Europe! ), gardening, etc. etc. I feel so much for all the young people out there trying to live, raise a family, work, etc. while dealing with r.a. No matter what your decision, Mary, I hope you can get you r.a. under control. I have never read such absolute bull, trying to guilt parents of children with JRA, is life not hard enough without this sort of nonsense. Why is it even given space! I am so angry. GRRRR! It appears that I have now been singled out by poor Joe of having a simple mind along with anyone else who chooses not to agree with TCM, I actually said “TCM for some people can be really good stuff” but I guess he didn’t read that part. Alas, I do have a simple mind, I simply want to see proper tests and trials done with any treatment, Eastern, Western, or otherwise before making claims. To me that is fair to everyone, especially when the claim is made by someone that seems to be portrayed as an MD. I know Lee didn’t claim to BE an MD, but the article was misleading at the very least in that respect. I am thankful that I live in this country and have a choice to access what I believe to be best for me. I am originally from New Zealand, and my Aunt has suffered from RA for over 30 years. She has had numerous joint replacements and a severe disease course. My understanding is that biologicals are still not available for them except in extreme cases of plaque psoriasis, although it looks like they are finally on the horizon for New Zealand RAers as I see many trials going on with bios at present down there. I just found your blog and I want to thank you so much for all of the information available! Thank you for posting both the truth and articles you find like these that some poor people might actually believe. Because while it won’t hurt to love on your baby more…trust me, it’s not going to cure them. Congratulations & good luck with your baby!! Quack! Yep, sounds like a duck! 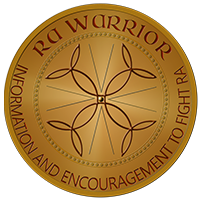 Im thinking that if the information about RA was much more detailed and clear it would help change peoples perception on why such strong drugs are needed. Even the articles written about RA by doctors use words such as “with treatment patients can have a normal , Fully Functional life”. Im in the beginning of my medication and treatment journey but so far Im very far from normal and fully functioning. I think doctors should differentiate between mild, medium, and severe RA and publish public available papers on this topic. I have severe pain in almost all of my joints including my spine and neck. I would like to know how many other people have this. I have also had friends question my medication choices. Its very frustrating! Sometimes I would like to invite them to watch me try and walk up the stairs! People just want to believe they are in control. There must be a “cure”. Something you can do or not do to get better. The truth is sometimes there isnt a cure and its nobodies fault. We do the best we can with the choices in medication we have until there is a cure. Wow. Just wow. I just read the two articles, dr. Lee’s and the response, and it is amazing how he was able to not only get all of his facts wrong but also blame juvenile arthritis on the parents being in the wrong mood at the time or the mom having a bad day when she has hormones going like crazy and is carrying quite a few uncomfortable extra pounds due to the baby sticking out of her front. The man is a moron and is not qualified in any way to speak definitively on ths topic. The man a only an acupuncturist! He’s just trying to drum up some business for himself! What a quack! Responding to this being tweeted Jun/17. I wonder what kind of doctor is this Dr Lee? Did he get his “doctor” credentials via correspondence school? Geez….how ignorant. The “cherry juice” cure reminds me of a family friend who told me her daughter was cured of RA by drinking goji juice and voila she just happened to be selling this juice. I never did ask who diagnosed her daughter but I suspect she was “self diagnosed”. It is annoying AF to get these unsolicited “suggestions”. Trying “natural” cures is a common one and I don’t respond politely anymore. Would they tell a diabetic to find “natural” treatment and forego the insulin? SMH…. I am open to alternative/complementary treatments as long as they do no harm and don’t interfere with my medical treatment. Accupuncture helps, massage helps, even experimenting to see if certain foods make inflammation worse but none of these are “cures”.